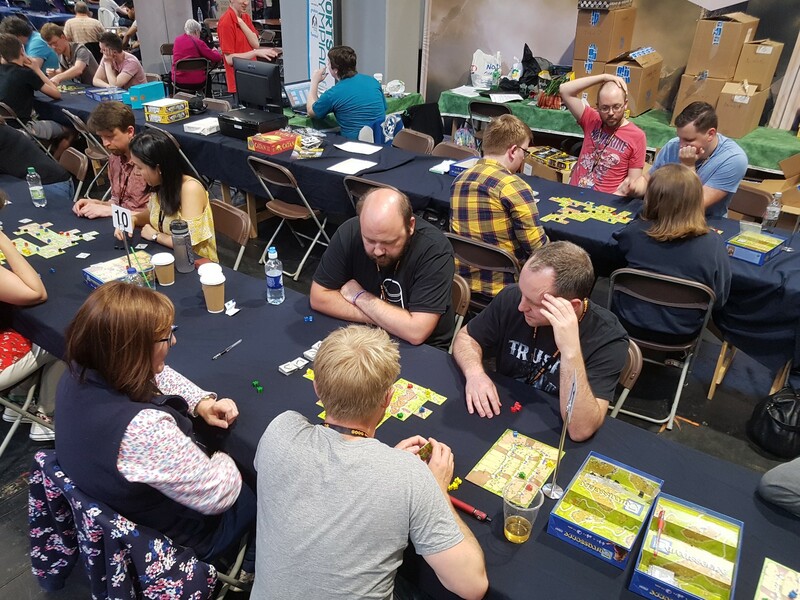 It looks as though the UK Carcassonne Championships will be on the Friday this year (rather than the Sunday), and will be running from 3pm to 10:30pm which is 7 and a half hours! Pure speculation, but I'm wondering if this means they're going to change the format to match the world championships more closely and do away with the rounds of 4-player games? I hope so anyway. That would be awesome. EDIT: No it doesn't mean this. If I'd actually taken the time to click the link for it I would have seen that it's the same initial 3 rounds, but then the top 16 go through to the head to head rounds. That's somewhat an improvement though! Really? I'm glad I didn't! Because the tournament doesn't start until the afternoon I plan to get there early, spend the morning looking round the expo and then go to the tournament afterwards and head home after that. Time to check the diary. Did anyone take part this year? 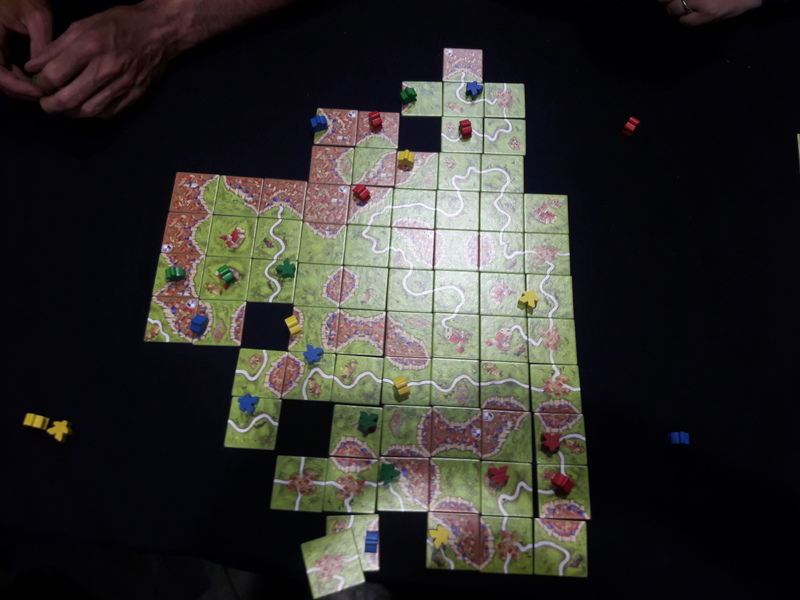 As with previous years, the first three rounds of the UK Carcassonne Championship this year used the ever (un)popular 4-player format. Position (1st/2nd/3rd/4th) and points scored per game were all used to create a ranking of all 53 players who took part, with the top 16 going through to a head-to-head (i.e. 2-player) knock-out stage. 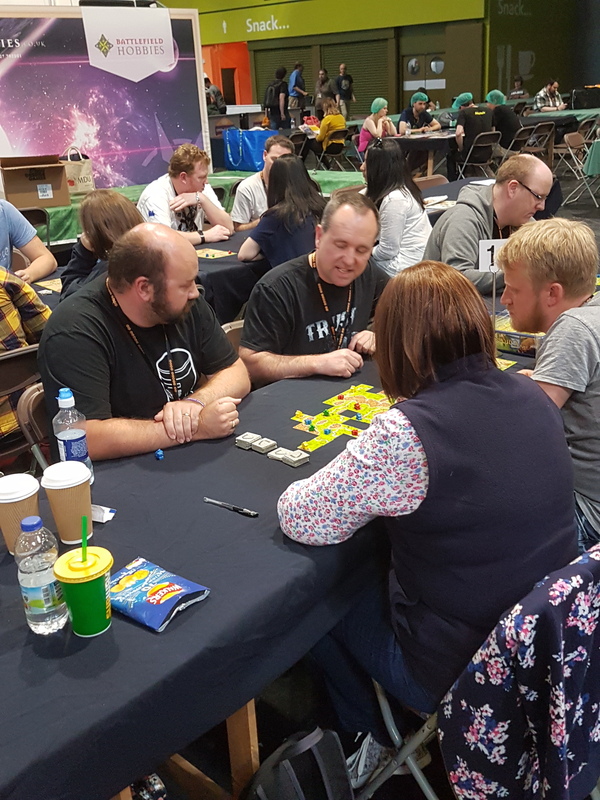 From here, the winners of each round advance to the next round and the losers are eliminated until eventually (after 4 games) only the champion remains, and is given £250 and sent to Essen in October to represent us at the world championships. Despite the inclusion of the 4-player format for the initial rounds, this year's competition was an improvement on previous years as, up until last year's tournament, only the top four players had gone through to the knock-out stage. Taking the top 16 means that the second stage of the competition lasts a bit longer of course, but it also gives more people a chance to prove themselves where it actually matters in the 2-player game, without being penalised too heavily for suffering from the curse of bad luck or unpredictable opponents doing strange things in the 4-player rounds. The first of my three 4-player games was my favourite by a long way. Although I didn't say anything until after the game, I recognised one of the other players as the previous year's champion (Ven Gee Lim) who went on to finish fifth at the world championships. So I knew this was going to be a challenge, despite the fact that I was placing the first tile and he was placing the last. This game got off to a good start for me with a couple of small cities that I kept to myself, two cloisters and some short roads that all kept my score ticking over nicely. I also got onto a nice long road with two of the other players. This road was eventually stolen and completed by one of my fellow thieves but I still benefitted from this as it completed one of my cities and a cloister belonging to last year's champion. There was some tussling for farms but I was the only person who really tried to steal anything with my increasingly desperate but ultimately unsuccessful attempts to get a second meeple onto the main farm that three of us ended up sharing. There were other farms as well of course, but overall everyone seemed to benefit roughly equally from these. In the end, the only thing that won this game for me was a big city that I hadn't had anything to do with! Two of my opponents were sharing this for 20ish points each but one of them had a second meeple camped outside it waiting to join on. I'd built a good lead and was in a strong position, but I'd worked out that my nearest rival would overtake me if he benefitted from the city that he was sharing. So I placed my final tile (a cccr) to join on the other player's meeple and took one point for the road. It seemed a little bit controversial at the time, but ultimately it ensured that I won the game and got the competition off to a good start. Ven Gee and I laughed about this afterwards, and he told me that he would have done exactly the same thing if he'd been in my position, so I felt slightly less bad about such a cut-throat move. My second game however was a bit of a disaster. For one thing I was last in the playing order this time, but while everyone in my previous game had seemed to be of a similar standard, the same clearly wasn't true this time and playing against such a mix of people brought with it an entirely new set of challenges. The guy to my left seemed to know what he was doing, but the woman opposite me claimed she had played just a couple of times before and was only there because her husband wanted to take part. I've known people say this sort of thing before when they're trying to lull you into a false sense of security but in her case it became entirely more believable when she struggled to understand how I was allowed to claim a farm that she had "already claimed" even though she'd actually claimed an adjacent farm. Chat about how farmers work then came up several times throughout the game, making any attempt I made to sneak anybody onto an existing farm rather less subtle as we then had to openly discuss how I had claimed a different farm and what would need to happen for it to be joined up. I knew I was in even more serious trouble when the guy to my left and the woman opposite me both ended up in a potentially valuable city that could be completed with a cfff. I created some good opportunities to kill their city, but rather than identifying the risk and helping me to shut it down, the other player decided instead to target me via a small city (1 tile: cfcf with pennant) I had claimed with the result that he was actually defending the other two players' city! And so, when it was completed for 18 points a few turns later and I ended up trailing by no small margin I started to lose any hope of reaching the top 16 and going through to the next stage of the competition. I did at least manage to avoid coming last in this game though, thanks to an equal share in the main farm (a farm I had to share with the guy next to me because the woman opposite me had joined two of his farmers onto it without even realising), and settled for a somewhat distant third. The game was won by the woman opposite me thanks to a lot of cloisters and a long road, and the guy next to me came second. One of the players at the previous table had allegedly been told by a "Carcassonne Expert" that nobody would be able to reach the top 16 of the competition without three solid wins behind them. This seemed mathematically dubious to me but with a first and a third I was pretty sure I'd need to win this game if I wanted to stand any chance of qualifying. And happily enough, it didn't start out as an especially aggressive game and the tiles were on my side. I shot into an early lead by around 10 – 15 points after about a quarter of the deck, but things started to slow down at this point and the others began to catch me up and then overtake me so I had to start looking elsewhere to generate some points. 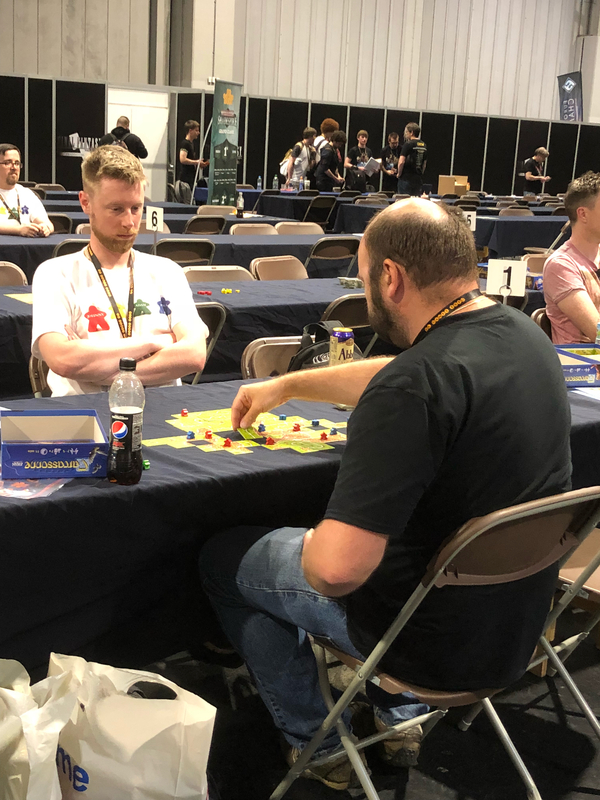 My closest rival was the woman sitting opposite me who had given herself away a bit by bringing her own meeples (something I tend to avoid as I don't want to make myself stand out as someone who has played a lot). She anticipated where the main farm would be quite early on and instigated a bit of a farmer war when I tried to join her on it. One of my farmers was a bit of a risky placement but fortunately I drew the frfr tile needed to connect it on my very next turn and the main farm ended up being tied between us after I blocked an effort of hers to keep it to herself with a third farmer. Having started second (and with no discarded tiles) I got to place the penultimate tile. One was a ccff with no pennant and the other was the fffr cloister. I had a meeple in hand so could claim whatever I drew, so was obviously disappointed when I turned my tile over to see the city tile. There wasn't anything clever I could do with this tile so I joined it to a city cap for 2 points and left the next player (my closest rival) to make 9 points with her tile. We totalled up the scores, and after all the fighting and investment the main farm was only worth 15 points despite showing a lot of early promise. So although this game wasn't nearly as frustrating as the previous one for me, I was disappointed to finish around 6 points behind the winner, and 1 point behind second place. First, third and third wasn't going to get me anything. But then, just as we were writing down the scores on the slip of paper I happened to noticed that we hadn't scored one of my meeples; it was the last meeple I'd placed who was still waiting patiently in his city to be returned to me in exchange for 2 points. The other players were happy to adjust the scores accordingly despite the oversight, with this little amendment seeing me finishing in second rather than third! 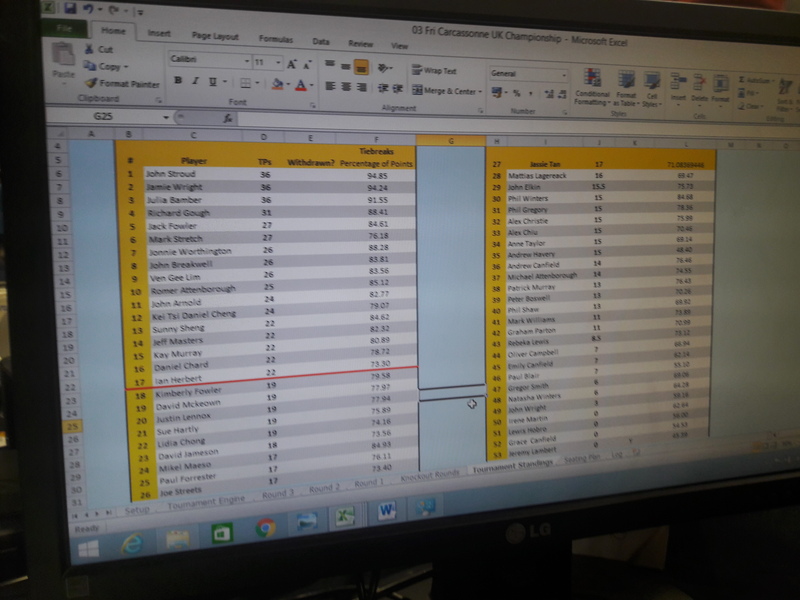 I wasn't entirely convinced that first, second and third would see me coming back after the dinner break either, but when the final standings were published I was delighted and surprised in equal measure to spot my name in 17th place! I was surprised because I didn't feel like I deserved it, and delighted because one of the top-16 players was unable to continue which meant that I'd qualified by the skin of my teeth and was through to the knock-outs! I was too excited to have anything to eat during the break and didn't really have long enough to eat anything anyway, so I fiddled about on my phone for a while and then went back to the tournament area. As the lowest-ranked seed I was placed against the top-ranked seed; John Stroud. I remembered John because he knocked me out of the 2015 semi-final and I know that he's no stranger to finishing towards the top either, so I was expecting a tough game. John placed the first tile and the game was underway. He enjoyed some good luck with the tiles he drew at first and kept his score ticking over nicely, but he certainly wasn't an aggressive player and didn't really attack me very much or respond when I threatened any of the features he was building. Within the first 12 tiles I'd trapped one of his meeples in a city but he then drew all three cccr tiles back to back which he placed in his uncompleteable city to extend it massively. Apparently he was going to throw points at it even though he knew it would never be completed and it soon became sufficiently valuable that I'd want to share it with him. Elsewhere though, I managed to generate points for myself from various cities and roads, and even a couple of cloisters, plus I had a small farm in the corner of the landscape which was now stagnant but unchallenged. John's farm was growing much more quickly however, so it made sense that I would try to share this with him. This was where the game really got going, but we were already in the second half of the deck by then and I got the impression he felt he was already beaten and had wasted too many meeples elsewhere. I can't remember whether the main farm finished two – three or three - four to me but ultimately I managed to win it outright. I also tied his big city which I'd killed earlier thanks to a very fortunate tile draw at the end of the game. With the farm and an equal share of his city there wasn't much else he could do and when we totalled up the scores I believe it was 122 – 101 in my favour (or something very close to this). Certainly not a huge winning margin but it had been a very long and intense game which had taken its toll on me. I was delighted to have made it into the top 8, but was seriously wondering how I was going to get through another game of Carcassonne with my brain being as fried as it was at that point. My next game was against Jonnie Worthington who I was immediately wary of based on his cool-sounding name. He seemed like a nice chap though, and was even willing to allow me a short break after my previous game to have a few swigs of Pepsi Max before our game began. I'm struggling to recall the details of our game as it was all a bit of a blur to me by then, with aspects of each game all blurring into the same game in my head. I do know I got a bit frustrated at one point where I had two cities on the go, both of which were just one tile away from completion, but I couldn't draw any city caps to finish them off and get my meeples back. Jonnie didn't really capitalise on my misfortune though, and I was able to put my unwanted tiles to good use elsewhere by working towards completing a cloister that I should probably never have claimed in the first place. As the game progressed we ended up sharing a worthwhile but incomplete city which I killed off when Jonnie attempted to get a third meeple into it. With a fourth meeple on a farm where I'd outfarmed him and another on a long road that I'd built (but not claimed) whilst working on my cloister I felt like I'd done all I needed to do to limit his scoring potential but hadn't generated much of a lead for myself and didn't have long to do so. Fortunately however, with just one meeple in hand I was presented with a series of opportunities for building my lead 4-points at a time with some small cities. I then placed my final meeple in an attempt to get onto Jonnie's road but never drew the tile I needed to share this with him. As it turned out, I didn't need to share his road and when we totalled everything up found that I'd won 86 – 76. After playing against a John and then a Jonnie it seemed like a good time to play a Jack, so I wasn't disappointed to be drawn against Jack Fowler in the semi-final. I was however starting to get quite tired and hungry by this point as it was around 9pm and the tournament had been running for six hours. Plus I'd run out of Pepsi Max which didn't help either. Anyway, I was a little nervous about this game as I'd just witnessed my next opponent beat a friend of mine (and former tournament winner) in his previous game so I knew I was going to have to up my game if I wanted to reach the final, and I wasn't sure how much more upping my game could take by this point! It was immediately obvious that Jack understood how to play Carcassonne at this level and he was quick to start making opportunities to trap my meeples. I wasn't always able to defend myself immediately with the tiles I drew but did manage to slow him down somewhat in this respect and threatened to trap his meeples at every available opportunity. However, his scoring of several 8-point cities in the early part of the game gave him quite a psychological advantage which took a lot to overcome and ultimately I felt like I was on the back foot by the middle of the game. I wasn't beaten yet though and continually tried to keep building opportunities for myself to stay in the game (with varying degrees of success). I was hopeful for a short period when Jack ran out of meeples but this wasn't for long, and soon he'd got himself back into the game and celebrated with a very convenient cloister that was almost complete when he placed it. This combined with his knowledge of trapping and blocking, and my limited supply of meeples ensured that I couldn't keep up with him. And to rub salt into the wound, he drew the final ffrr to join a second farmer of his own onto our shared farm. When we totalled everything up he finished at least 15 – 20 points ahead of me, and although it could easily have been a very different story I did feel that my opponent had played well enough to deserve the win. With this in mind, I wasn't feeling too upset to have been eliminated even at this stage, and left the competition to go and join the others for a while with some pride still intact. No small amount of thanks to Tom, Jen, Graham, Rich and Luke for their patience and for sticking around for as long as I kept them waiting, and for their support throughout the day. 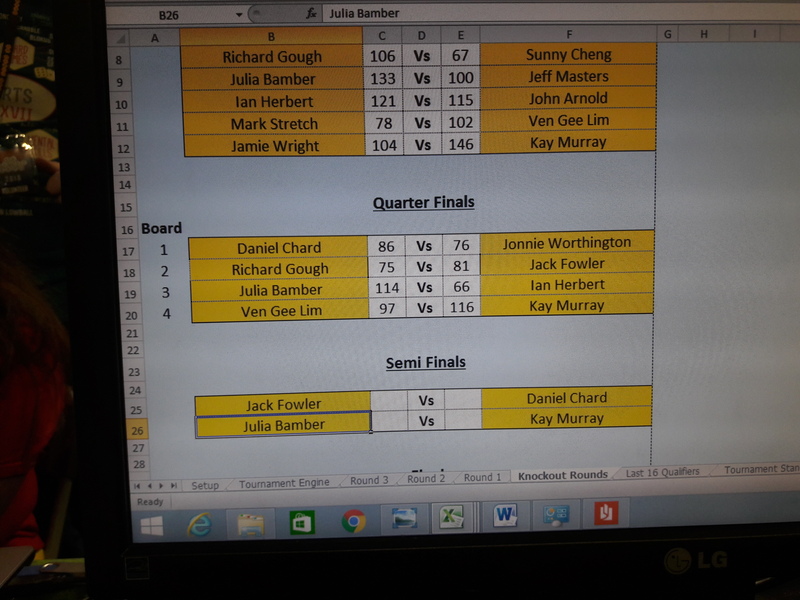 And although I haven't seen the official results yet I have heard that Julia Bamber (forum member Asparagus' daughter) was also eliminated in her semi-final , and that Jack went on to win the final against Kay Murray. Whilst the slackers didn’t watch all of the games all of the time we popped over now and again to see how Dan was getting on and in the latter stages camped ourselves in the games library area close by so that we could watch from afar. Dan does not do himself justice, his concentration when playing is phenomenal. He totally gets into his Carc zone. So much so that in the quarters match I took the pic of the game and had stood directly behind him chatting to one of the organisers finding out how the tournament had gone throughout the day and he was oblivious to us being there or that I was taking pics. Jonnie, I have to say was also in his zone and it shows how much these guys and gals invest into the game we love so much. Well done for doing so well and getting into the semi finals Dan. Thanks for the write up too, really interesting to hear how your games panned out. It must have been so draining to concentrate so intensely for such a long time. Sorry to hear you ran out of your refreshment of choice - if I'd had known I would've tracked you some down. Hope you've stopped seeing Carc tiles in the your sleep now. Congrats to the tournament winner too, hope you have a cracking tournament representing the UK later in the year. You may be interested to know that I asked the adjudicators what the scores were during your 3rd game (the one I took a photo of, standing right next in front of you, but you didn't seem to see me). I think 8-9 people had all scored 12 points (1 win and 1 2nd I suppose? ), you were around 5th-6th place at this stage based on % point difference. Congratulations on your result and well done representing our forum on the national stage; although you didn't come home with £250 to spend at Essen and the chance to compete in the final - at least you know you need 2 bottles of Pepsi max next year! Nice write-up and nice result, Dan! When i'm participating in a table tennis tournament, it's the waiting in between 2 matches that kills me...for you, it's the lack of pause...not sure what's worse? Is this the best UK champs placing for a CarcC member in this tournament to date? No, James Cook is a Carcassonne Central member and the UK Champion. As is the 2016 champion, who's name escapes me!